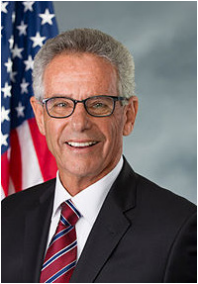 On June 22, 2017 Congressman Alan Lowenthal (D-CA) introduced the “National Multimodal and Sustainable Freight Infrastructure Act.” This bipartisan legislation would create a sustained, dedicated revenue source to strengthen America’s economic competitiveness by investing in the rebuilding of crumbling U.S. freight infrastructure. According to Congressman Lowenthal’s office, H.R. 3001 would raise around $8 billion a year through implementation of a national one percent waybill fee on the cost of transporting goods. Funding would be collected in a Freight Transportation Infrastructure Trust Fund, and annual collections would be divided evenly between two programs: a formula program that provides funds to each state, and a competitive grant program available to local, regional and state governments. According to the Congressman, funding would be dedicated to freight-related infrastructure projects throughout the nation, with a focus on multimodal projects and projects that rebuild aging infrastructure while relieving bottlenecks in the freight transportation system. During the 114th Congress, Representative Lowenthal introduced the “Economy in Motion Act,” which is largely similar to “National Multimodal and Sustainable Freight Infrastructure Act.” The freight policy and programming achievements made under the FAST Act advanced principles that were included in “Economy in Motion,” necessitating revisions to the original bill. Eleven co-sponsors joined Congressman Lowenthal in his introduction of “The National Multimodal and Sustainable Freight Infrastructure Act,” including Representatives Nanette Barragan (D-CA), Earl Blumenauer (D-OR), Matt Cartwright (D-PA), Judy Chu (D-CA), Robin Kelly (D-IL), Mark Meadows (R-NC), Gwen Moore (D-WI), Grace Napolitano (D-C), Mark Pocan (D-WI), Dana Rohrabacher (R-CA), and Mark Takano (D-CA).